The TD-2000 models are supplied as standard with a CD-ROM, user guide, USB cable, AC adapter and powerful labelling software. With over 20 years experience of developing professional label machines, Brother has added to the recently launched TD-4000 range with the new TD-2000 2.2” labelling & receipt print solution. The TD-2000 offers the performance, features and media capacity of desktop printers but can be powered by a rechargeable battery pack and print wirelessly on a trolley, a busy counter or virtually anywhere in the workplace. Due to its spindle-less design, the TD-2000 can accommodate rolls of up to 5” in diameter meaning less time wasted reloading media. 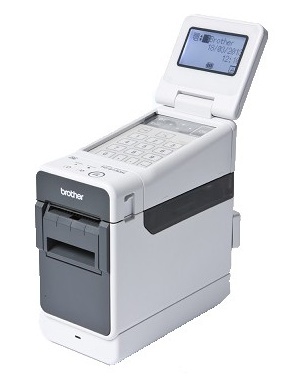 The range is made of three models which vary in print resolution and connectivity. All three models come with USB and a serial interface port while the network models (2120N & 2130N) come with additional Ethernet and USB host ports with the option to add a Wi-Fi or Bluetooth interface module. Increase productivity & efficiency by enabling busy retail workers to print a wide range of labels on the shop floor by incorporating TD-2000 with a trolley/mobile workstation. With its compact design, the TD-2000 is also ideal to use on crowded retail desktops and counters without sacrificing valuable workspace for a standard sized desktop printer. Sharp text, logos and barcodes printed quickly on high quality Brother media can help contribute to enhanced customer satisfaction at the counter or check out. A compact machine with the speed, features and media capacity of a desktop printer plus the option to get out and about if you need to, the TD-2120N allows you to print professional quality custom labels or receipts at 200dpi, wherever you are in the workplace. Printing from your existing systems is simple thanks to our range of software developer kits, plus the optional wireless means you can connect direct from your mobile device or PC for ultimate convenience. You can also add a battery and touchscreen to go truly portable. The flexible TD-2120N can accommodate rolls of up to 5” in diameter, meaning less time wasted reloading media, plus there’s a choice of optional extras that ensure it’s perfectly suited to your business needs. Brother TD-2000 2.0" Wide Label/Receipt Desk-top Printers Series TD2130-EU 2" DT label/receipt/wristband - TD-2130NHC 2.0" wide PDCs media (wristbands & labels) - USB - RS232C - Ethernet - 300dpi - TrustSense - 152,4mm/sec. What's in the Box: AC Adapter, Power Supply Cord, USB Cable, Software): EU VERSION. Brother TD-2000 2.0" Wide Label/Receipt Desk-top Printers Series TD2130-UK 2" DT label/receipt/wristband - TD-2130NHC PDCs media -wristbands & labels 2.0" wide - USB - RS232C - Ethernet - 300dpi - TrustSense - 152,4mm/sec. What's in the Box: AC Adapter, Power Supply Cord, USB Cable, Software): UK VERSION.